It’s time to get away from Christmas table settings and focus on other ones. Unfortunately, I’m running out of digital photographs and have now been taking pictures with my digital camera of film table settings. While the quality isn’t the best, I don’t think it’s all bad, either! When I moved into my first apartment, family was very generous in seeing to it I was taken care of when it came to furnishings and things that make a house a home. My mother gave me a set of china to use on Sundays, holidays and special occasions. She and dad got them for a wedding present from friends who had collected them by filling their tanks full of gas. The china was a premium for filling up at a local gas station. It is a simple pattern, streamlined in a classic 1960s manner. The base is white with two gold bands as trim, one band being wider than the other. 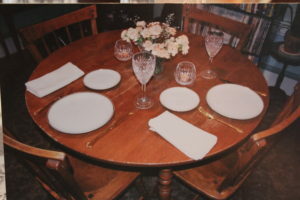 Mom gave me a setting for four place settings plus some accessory pieces. I used them for my birthday dinner in 2008, along with my Waterford crystal stems in the Thanksgiving/Harvest pattern (Cash’s of Ireland), Golden Royal Plume flatware (antiques store in Butte, MT), and a centerpiece of peach carnations in a glass basket of unknown manufacture but made for FTD Florists (thrift store find) and votive holders made by Waterford in the Reflections pattern (bonus for ordering the stemware). Napkins are from the Hauge set (K-mart). I’ve added to the set over the years, but Mom’s special pieces are kept in a separate box. Golden Elegance table setting for my birthday in 2008.